As a new angler, one might think that size does not matter and you only need something small and basic to get the job done, but this is not the case and the top anglers will always recommend the top range high-end fish finders for more than the fancy look and the clear imaging they provide. These experts generally focus on key features that impact your experience. 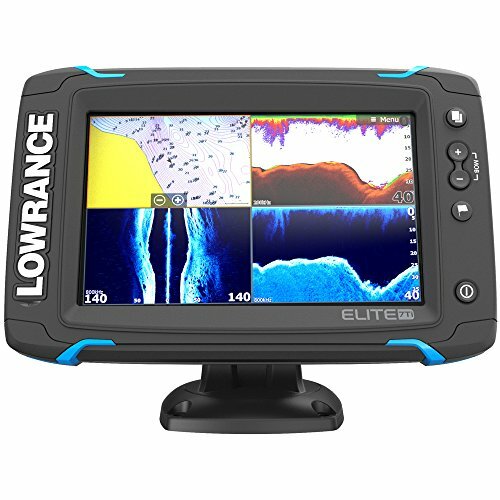 The Lowrance Elite-7 Ti fish finder is one of these high-end fish finders that offer all of the top features that you will see in many other expensive fish finders. Lowrance has introduced wireless connectivity to enable the user to browse online and purchase upgrades and maps, while the new and improved TotalScan sonar has the ability to add more frequencies and more versatility. Since the CHIRP sonar has now become renowned for the quality it offers, Lowrance has been sure to include this in the fish finder. It generally operates at 83/200 kHz and provides clear pictures of the water. The fish finder also has a maximum depth range of 1000 feet, but DownScan Imaging has also been added for more versatility. The fish finder also includes StructureScan and while this has been proven to show very clear pictures of the bottom, it does require the additional TotalScan transducer. Since no Ice Machine upgrades are available, we understand that the transducer will work in the ice to detect fish during your ice fishing trips. The backlight can be toggled on and off, but it is a handy addition when the sun is beaming directly on the screen. The backlight was primarily included to make night fishing a little easier and possible if you are not feeling the need to use a torch on the screen. One of the new features introduced to the Elite series is the ability to wirelessly connect to the internet. An additional MicroSD card slot has been provided, enabling the user to download upgrades and additional maps to expand the already vast library of the GPS. The GoFree cloud system puts the power in your hands when it comes to sharing hotspots and saving waypoints for friends and other users to see. The Lowrance Elite-7 Ti includes the same GPS system found in all the other fish finder they have produced. It includes a high sensitive antenna and provides a library of more than 3000 locations. These include lakes, rivers, and part of the US coastline, but this can also be upgraded and new packages like the LakeInsight and NauticInsight charts can be added. The GPS in this fish finder has one unique feature and this is the Insight Genesis. Insight Genesis enables the user to create custom maps and plot around 3000 waypoints to various locations. With the internet, these can be shared if needed with other users on the app. Overall, the fish finder is definitely quite durable and easy to use. The display system seems to work perfectly and the addition of the backlight does give it some versatility to be used at night times. Navigating through the settings are made simple with the touchscreen system, but it would have been much better with the multi-window function found in the HOOK series to display multiple screens at once. It is also worth mentioning that the fish finder has an IPX7 rating when it comes to resisting water. This means that is has the resiliency to withstand the water and the pressure of up to 30 minutes when placed in 1 meter deep water. However, we do not recommend testing this as the fish finder is not built for swimming per se. Compared to the Elite-5, the Elite-7 stands out quite a bit when it comes to overall performance. Not only does the extra 2 inches on the screen make a huge difference when the sun is beaming down and the screen is unreadable, but it makes the icons easier to spot. The addition of alarms will notify you immediately when a fish has been spotted to ensure you never miss a heartbeat. Additionally, the internet connection and the GoFree cloud storage system is ideal if you are are fishing with friends on another boat. The versatility should enable you to never lose each other and share waypoints and hotspots of specific locations. This will register immediately and other users can go to that location in time to find the fish. As we have already mentioned, the GPS is one of the top features and it already contains the maps and charts of multiple different locations in and around the US. However, these can be upgraded to expand the library, but it is also quite expensive. The antenna turns out to extremely sensitive and your location is quite accurately mapped. We enjoyed the ability to plot multiple different waypoints beforehand and instead of simply sticking to fishing, enjoying nature and going a little sightseeing is now also on the cards. The Lowrance Elite-7 certainly has one of the most effective GPS systems on the market and closely competes with Garmin, the leader in GPS technology. When compared to all the other Lowrance fish finders, the Elite-7 TI certainly stands out as one of the high-end fish finders. It is quite expensive, but does also have all the combined features found in many of the previous series that have been released. The only real competition for the Elite-7 is the Lowrance Elite-9 when it comes to the Lowrance product line. With such an expensive price, the Lowrance Elite-7 certainly competes at the top level and the Garmin Echomap CHIRP 73SV with transducer is around the same price, but has a ton of focus placed on the quality of the GPS. One of the main advantages it has is the addition of more built-in maps to save you money. The Garmin Echomap CHIRP 73SV includes an extremely effective transducer, but the screen is somewhat smaller. Another advantage the Lowrance Elite-7 has is the ability to navigate through the options using the screen, while this fish finder has buttons on the side. If you are looking for great quality in your GPS, this fish finder should be a good alternative. The Raymarine Dragonfly 7PRO features a 7-inch screen and it is much more affordable than the Elite-7, but it only has a maximum depth range of 600 feet. The fish finder is a little more bulky and that makes it harder to store, but it also contains WiFi connectivity and built-in US Navionic maps to save you a some additional cash. See our Raymarine Dragonfly 7PRO review. Finding a great fish finder at a decent price is not always possible, but the Lowrance Elite-7 certainly made this almost possible. While it is still a little expensive, the fish finder has all the top quality features, but does become a little expensive when adding all of the upgrades. One of the other things that we should mention is the fact that it can easily be mounted, but the instructions are quite hard to understand at first. 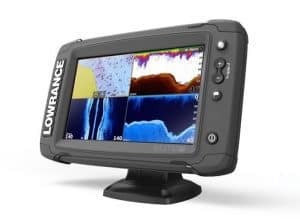 Fishing Tech gives the Lowrance Elite-7 Ti fish finder and overall rating of A and we would recommend it to the more astute anglers looking for an upgrade of quality in their former fish finder. The Elite-7 Ti should definitely add some new dimension to your fishing experience.